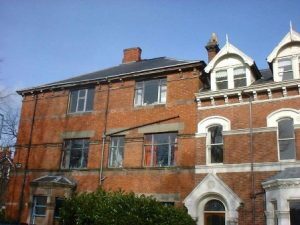 Built in 1870 as a private home until the death of the owner, when it was converted into six flats and the unlisted elevation of the building then drastically altered. Over the years the flats declined and the building was closed following a fire in 2000. 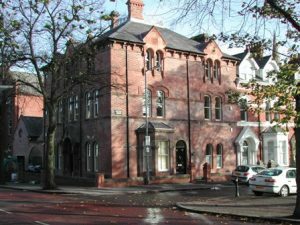 It was subsequently subject to demolition considerations but Hearth Housing Association were able to negotiate a lease and get the building listed, protected and saved for being lost entirely. During the period of listing and raising adequate funds, Hearth installed some temporary ‘caretaker’ artist tenants in the building to ensure its security through occupancy. 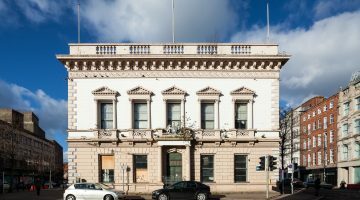 This interim period enabled works to start in 2004– the major element being reinstatement of the original historic facade. The building now offers holiday accommodation and flats and the former coach house and outbuildings to the rear were converted into a micro–brewery and restaurant now known as Molly’s Yard. NIEA Listed Building Grant Aid; Heritage Lottery Fund; Architectural Heritage Fund; and Hearth’s own funds.